Roddrick Henry: The 6’4 freshman out of Orlando Jones is bouncy and a strong finisher around the basket. He plays bigger than his size and his skill development out on the perimeter is improving. He dropped a couple of catch-and-shoot threes with good form in both the four-on-four and five-on-five sessions. James Repass: The freshman from Providence stands an imposing 6’10 with a strong frame. He won’t win any run/jump athletic contests but he has good hands and footwork in the post, scores well inside with either hand, and plays hard. He’s a rugged interior defender and rebounds his area well. As Repass sheds weight and adds muscle over the coming few years, he will become a better athlete and a higher level recruit. Keano Calderon: A sophomore out of DME Sports Academy in Daytona, the 6’5 athletic slasher was an effective finisher at the rim both in transition and on drives from the perimeter. He got to the free throw line frequently and connected at a good rate. Calderon was also a very active rebounder, especially at the offensive end. Osei Price: Price is a 6’4 sophomore wing out of Montverde Academy. A bouncy and lanky athlete, Price finished above the rim frequently on Saturday. A good straight-line driver, he uses a quick first step to get by his defender. A solid rebounder at both ends, his length and foot speed suggest he will be a multi-position defender in time. Ernest Ross: A freshman that stands 6’7, the Alachua Santa Fe product has an intriguing mix of size, skills, length, and leaping ability. He is swift when running floor, gets off of his feet quickly for rebounds, and can put the ball on the floor for a dribble or two and score from the high post or short corner areas of the court. Lenzy Hancock, Jr.: Hancock (pictured) may have been the most improved player from when we last saw him prior to his freshman year in the fall of 2016 to now. The 6’7 forward out of Jacksonville University Christian has improved his body and coordination and the result is a more active and dynamic player. He displayed solid scoring tools from fifteen feet and in, good passing instincts, and a more aggressive demeanor on both ends of the floor. Rhodney Donaldson: Only an 8th grader at Tallahassee Florida State University School, the 5’10 point guard looked comfortable and confident against older players. He was solid with the basketball against pressure, an effective passer, and shot the ball well from the perimeter. Donaldson also plays with a bit of a cockiness/confidence/edge to him, which is a good thing when playing up. Yussif Basa-Ama: A 6’10 sophomore out of Westlake Prep in Broward County, Yussif was undoubtedly one of the top players in attendance. His defense is ahead of his offense as he is a shot blocker with length and bounce. Basa is fast up and down the court in transition, active around the basket for put-backs and his improved post scoring skills make it a requirement for guards to get him the ball inside. David Perez: A sophomore guard out of Miami Riviera Prep, the 6’1 Perez was quite impressive despite battling some injuries. Slick with the basketball and strong of frame, he finished well at the rim in traffic and through contact. His shot looks solid from mid-range and in but a wrist injury had him hesitant about pulling the trigger from deep. Zachary Anderson: A sophomore from Apopka that stands 6’6, Anderson flashed potential on Saturday. He hit a couple of threes of the catch, scored at the rim in transition and showed an ability to get to the basket within a couple of dribbles from beyond the arc. Thin but with a long wing span and an impressive vertical, he has the physical tools to make an impact the next couple of years. Joe Stubbs: An athletic sophomore out of Lakeland Santa Fe Catholic, Stubbs is a creative scorer that has the ability to finish over, around, and through defenders at the basket. When he does attempt jumpers, he connects at a decent rate. An active rebounder and defender, Stubbs can be disruptive when focused. Delo Elisee: A freshman listed at 6’8 out of North Florida Educational Institute in Jacksonville, Elisee impressed with his strength and activity around the basket. He rebounds well and defends the basket with a passion. Offensively he’s most effective putting back misses by teammates but he did show a soft touch when going up for close-in shots. Giancarlo Rosado: Standing 6’7 with a solid frame, the sophomore out of Palm Beach Lakes defied expectations with a soft scoring touch around the basket as well as the ability to get off the floor and challenge or outright block shots. While maybe not the most athletic player, he’s not bad and he displays a solid basketball IQ. Jaylen Haynes: It feels like we’ve seen a lot from Haynes over the last year and he keeps producing. The 6’7 sophomore forward from Fort Lauderdale Dillard is an active rebounder that sprints the floor and has become a good interior scorer. Haynes is quick off of his feet for boards and blocks and if given the opportunity can grab defensive rebounds and push the ball up the floor without handing it off to a guard. 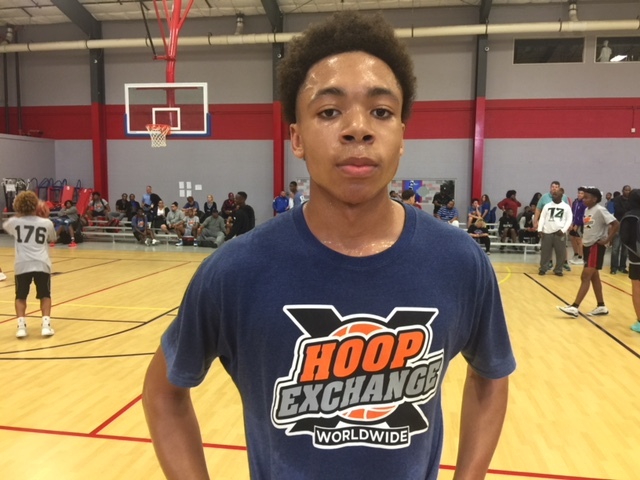 Emmanuel Maldonado: A 6’2 freshman guard out of Orlando Colonial, he put on quite a show when challenged to a “mano y mano” duel during one contest late Saturday afternoon. He quickly dropped a trio of threes, dished out three assists in a flashy manner and finished his flurry off with a crafty off-hand finish at the rim. All the while, his face never changed expression, as if this is a routine occurrence for him. If so, watch out!